1. Heat the butter in a small pan and cook the garlic and rice together for 1 minute. Add 1.2 litres of hot stock and cook for 20 minutes, stirring from time to time. Add the peas and cook for a further 3–4 minutes until the rice is tender and creamy. 2. Meanwhile, stir the contents of the Flavour Shot and pour into a large frying pan. Heat for 1–2 minutes then add the chicken breasts. Gently cook the chicken for 4–5 minutes on each side until golden brown and cooked through with no pink meat. 3. Add the wine to the pan and bubble rapidly for 3 minutes to evaporate the alcohol. Add the remaining 100ml stock and the mascarpone, stirring to make a smooth sauce. 4. 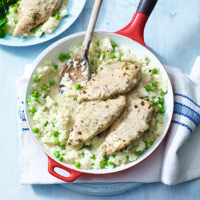 Pile the chicken and sauce on top of the risotto, take to the table and let everyone help themselves. Serve with steamed greens.